As is the case with all testosterones, the Propionate version will work in a similar manner. That means, increased strength, stamina, libido and aggression. Testosterone is what makes men, men -- stronger and more muscular than women, with less fat. It also is what makes men lose their hair, causes oily skin and enlarges prostate tissue. But you have to take the bad with the good, especially if you want to grow muscle. Of course, as is the case with any testosterone, Propionate will aromatise and part of it will be converted to estrogen. That in itself isn't so bad since estrogen also increases muscle size and IGF production and helps maintain healthy lipid profiles. But too much estrogen is the bane of anyone looking for a hard, lean physique. Therefore, when using prop, or any test, it's recommended that a small amount of anti aromatase such as arimidex or aromasan be used along with it. Anti estrogens such as Nolvadex will not work as well since it's site specific and has a rebound effect. (More about that in another profile). 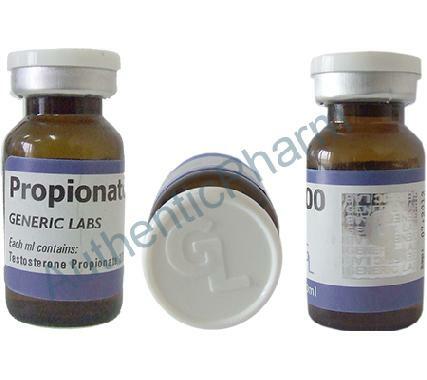 Test Propionate, or prop as it's referred to, is a slightly different substance from all other testosterones. It's much faster acting and consequently does not stay active for very long. (Approximately 48 hours). For this reason, multiple weekly, or better yet, daily, injections are required. So what's the benefit of using something that needs to be injected every day? There are several theories about that. For one thing, prop becomes active instantly. Blood levels of T will rise in minutes. This provides instant boost energy and an all around good feeling. It also makes prop a favorite among athletes who might be drug tested. You can use prop every day for a month and stop 2 days before a test and register normal. (Maybe even a little low since you'll be suppressed). But more than anything else, prop is a purer form of testosterone, mainly due to it not being connected to an ester which allows for slow release. In other words, when you use, let's say 100 mgs of cypionate, you don't get the full 100 mgs since the ester itself is part of the molecular structure. The ester takes up room in the 100 mgs equation. It's estimated that on 69% of cyp or enanthate is actual testosterone, whereas 84 % of Propionate is active testosterone. Yes, that seems a little deceptive. A hundred mgs should mean a hundred mgs, right? It's just one of those technicalities that normally don't make much of a difference. But for bodybuilders using high dosages for months and are looking to get the biggest bang for their buck, that little bit means a lot! Another nice advantage of Propionate is that it causes less bloating than longer acting esters. Besides the cosmetic advantage it allows test to be used while cutting perfect for competitive bodybuilders. This alone is why you can never tell a prop lover test is test. There is a difference. How much of a difference, however, is arguable. One of the accolades awarded to prop is that it kicks in sooner than other testosterones. Well, yes and no. As mentioned, it becomes active in minutes, and at a higher concentration, making it preferable for the beginning a of cycle as a kick start. Then again, any oral will do the same thing. Also, either cypionate or enanthate will raise T levels within 24 hours -- not weeks as is often mistakenly claimed, so how much of a head start are really taking about here? This is a personal choice. For some it's worth the daily injections for others it is not. At any rate, prop gives undeniable results and stacks well with any other steroid. Every other day dosing is very effective if prop is stacked with another longer lasting steroid . (As it should be). For more even levels, every day dosing is suggested at a dose of 50 mgs though some opt for 100mgs or more. Aggressive PCT with ancillaries and supplements is necessary after a course of Testosterone Propionate.